Japan’s Yuzuru Hanyu won gold at 2018 Rostelecom Cup with nearly 30 points to spare. 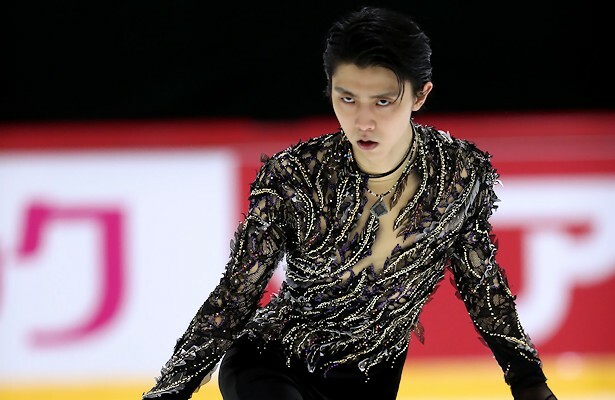 Japan’s Yuzuru Hanyu pocketed his second Grand Prix gold (278.42) after a comfortable lead on Saturday afternoon at 2018 Rostelecom Cup in Moscow, Russia. Morisi Kvitelashvili of Georgia maintained second to win silver (248.58), while Japan’s Kazuki Tomono rose from fourth to capture the bronze (238.73). Yuzuru took a hard fall on a quad loop in practice, twisting his right ankle, and left the session early. The two-time Olympic champion opted to open his routine with a quad Salchow. The skater was not perfect, falling on a under-rotated triple Axel and popping another, but still showed strong spins and footwork to easily win the free skate with 167.89 points. He was instantly showered with Pooh bears by appreciative fans at the end of his dramatic routine to music from Edvin Marton. Kvitelashvili under-rotated a triple Axel, but landed two clean quad combinations and displayed level 4 spins throughout his routine to music from Mozart, L’opéra Rock, earning a season’s best of 158.64. Tomono had several under-rotated jumps and had a few minor mistakes throughout his routine to music from Riverdance, but landed a clean quad Salchow to score a season’s best of 156.47. Russia’s Mikhail Kolyada, who was in eighth after the short program, placed fourth in the free skate (156.32) and overall (225.42). His routine to music from Carmen featured a quad Salchow and quad toe-triple toe. Keegan Messing of Canada rose from seventh to fifth (220.75), while Paul Fentz of Germany slipped to sixth (220.57). Alexander Majorov of Sweden fell from third to ninth (205.59) after an error-ridden program.